When we kind of get tired of meat or fish or taking a break from carb-laden pasta, noodles or bread; we turn to fresh vegetable rolls whether it’s the Vietnamese version or the Filipino-style more popularly known as fresh lumpia. 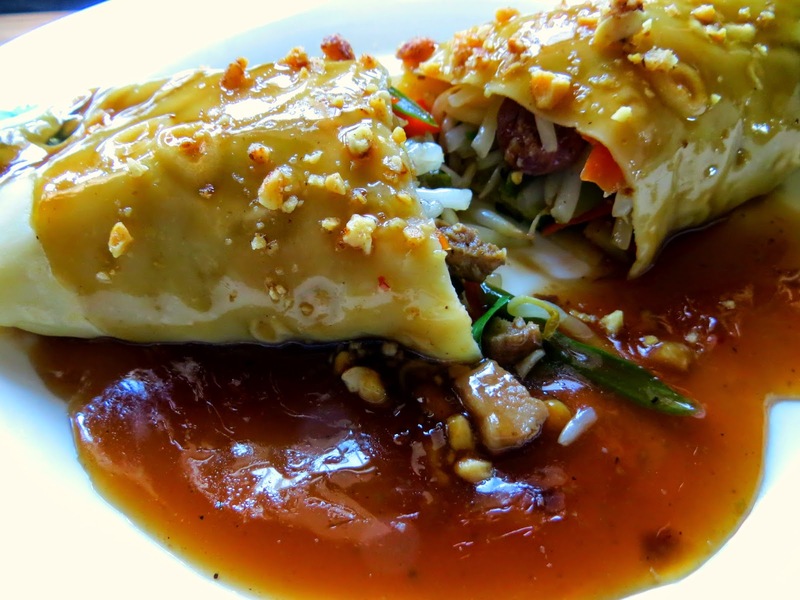 Lumpia is a gathering of fresh vegetables sautéed with tofu or chicken or pork or shrimp (or all of the above if you’re feeling indulgent) then encased in crepe-like wrapper served with a special sauce then topped with ground/crushed peanuts and garlic. Some do not like the wrapper and eats this naked and ridiculous as it may sound, I have a friend who hates veggies but loves my sauce and the wrapper. It is preparing all the ingredients that take long especially when you have more than four vegetables in the mix and you’re serving an army. But it cooks really fast so it is a matter of choosing the vegetables with similar cooking time and you can just dump them all together in a wok, allow the natural juices to render and the steam will eventually do its work. The way my mom does it is really labor intensive. She would cook each separately, like making jhap chae and just toss them all together so people wonder how come all the vegetables are cooked to perfection. But even as the veggies are crunch-perfect, it’s still the sauce that can make or unmake it. The sauce should be the right blend of salty and sweet with a little kick from garlic and the consistency can’t be too thick or thin bordering on runny. I have adapted the sugar caramelization aspect my mom does when she makes estofado as the starting point of my sauce plus all the juices/broth rendered from the vegetable filling. Trust me, there will be enough especially when you use a lot of vegetables like in my case. My mom would push all the veggies to the side of the wok so the liquid will ooze to the middle and that’s the cue. Now, I just transfer the cooked veggies to a colander to collect my prize for the sauce which has all the flavors needed to make the sauce even better. The separation also prevents the vegetables from cooking further so it’s like hitting two birds with one stone. Ah, you may say so much ado about lumpia but that is the essence of cooking. It can be easy or difficult or it could require patience or attention to the smallest details to come up with a dish to please. With that said, shall we commence? This is how I made this version or you can check a previous lumpia post. 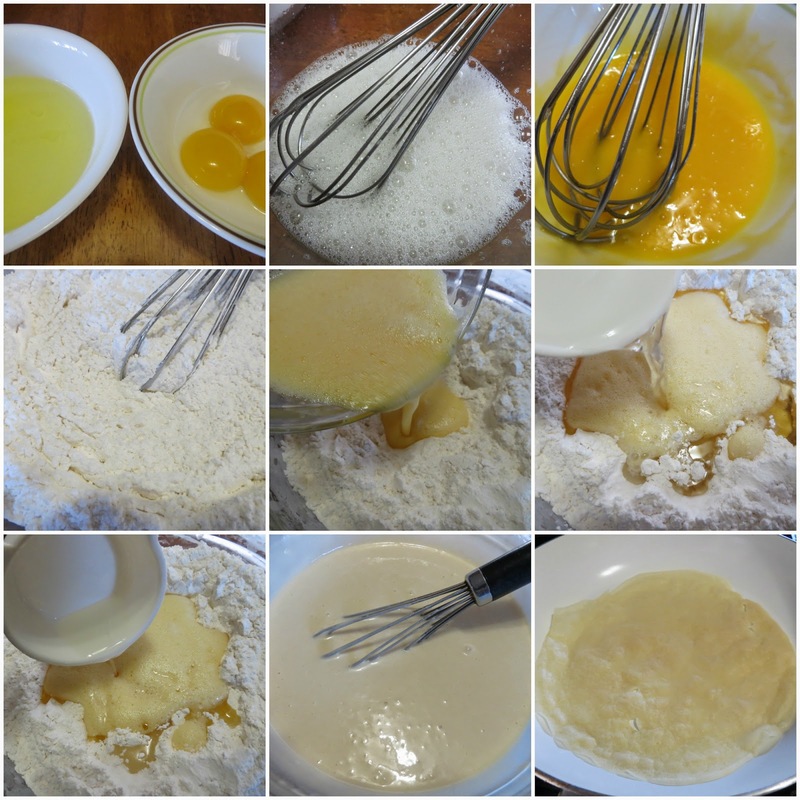 Pour a scant 1/3 cup of batter into the pan, swirling to evenly coat. Cook one side for 2 minutes or until the crepe pulls away from the sides of the pan. Using a spatula, flip the crepe over and cook the other side for 20 seconds. Stack the cooked crepes in a plate; each one separated with wax paper. Add the carrots after a minute and toss together. 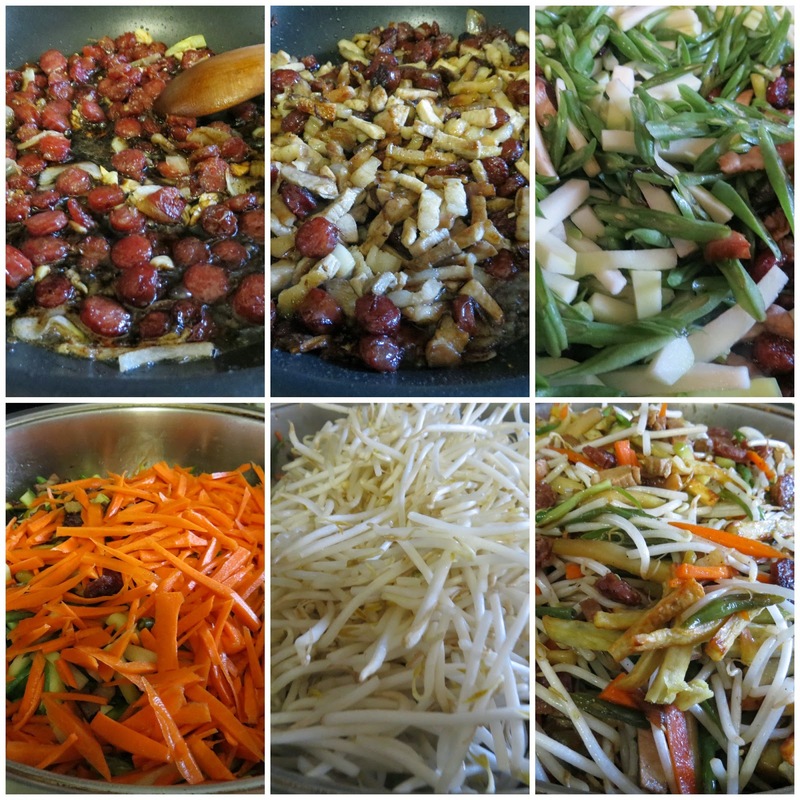 Cook for 3-5 minutes then add the bean sprouts, the sweet potatoes and chopped cilantro and cook for another 2 minutes. The sprouts cook fast so remove the pan from the stove. It will continue to cook and you want to retain its crunch. Place a wrapper on a plate and scoop 2-3 tablespoons of the vegetable filling at the center in a straight line. Add more depending on your desired size as long as the crape is big enough to wrap it. Fold the sides over the filling and seal. Pour sauce on top and sprinkle with ground/crushed peanuts. Serve and enjoy! You may use lettuce leaves as bedding for the filling. I did not have any so I used a sprig of cilantro for each lumpia.